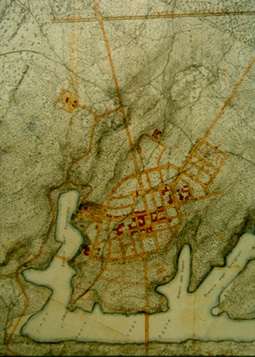 As follows a synthetic reading of the foundation town of Sabaudia and design proposal for the area towards its gateway from the via Appia, to which it is connected. It was put forward by Gian Luigi Maffei, Giuseppe Strappa, Laura Bertolaccini, Tiziana Casatelli, Paola Di Giuliomaria, Amedeo Trombetta, Alessandro Valenti and Marco Valenti and is proposed as a topic for discussion on the design-reading relationship of the modern town. A relationship the speakers maintain wholly identifies it. The birth of modern architecture in the Roman area continues along the lines of the formative process of types and fabrics, evidently clashing with theories on what is modern in international terms. 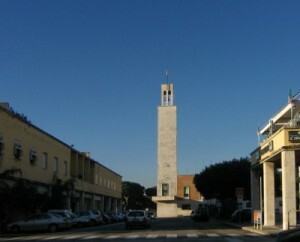 Due to their unity of conception and speed of construction, towns founded around Rome between 1928 and 1936, especially in the Pontine marshes, clearly express the breaking away of modernity from tradition: Littoria, Sabaudia, Pontinia, Aprilia and Pomezia are modern towns which still respond to those principles of organicity due to a relationship of continuity with their territory, to their hierarchization of streets and to their position and identification of building types. Of these, perhaps Sabaudia is the most significant on account of its innovative character, despite its retention of a traditional town structure. Sabaudia’s origins are linked to the last phase of an historic cycle that includes the recovery of Roman thoroughfares, the restructuring of the Lepini mountain promontory settlements, originally built for defence purposes, and the formation of rural settlements in the bottom of valleys or plains for productive needs. That is why the foundation of this town must be associated with the conclusion of major anthropization cycles of the territory in the Mediterranean basin, which also led to the reclaiming of the Salonika plain and of the lower Rhone areas, as far as the Algerian Mitidja. This consideration is of fundamental importance because it enables us to define the nature of the relationship between settlements and their territory symbolically represented through entrances to towns. The first territorial anthropization plan cycle that generated the settlement of Sabaudia took place due to the immigration of Italic nomads in waves from northern regions around the first millenium B.C. The structure of routes took place according to a “territorial type”, which is quite constant in central Italy: from paths along the Appeninic main ridge towards (often orthogonal) secondary ridges coastwards. Subsequently, paths parallel to the orographic main ridge formed along hill slopes, giving rise formerly to higher and then to lower promontory settlements, until the valley bottom was colonized. This territorial appropriation process can clearly be read in the Lepine mountain ridge according to a layout which, from north to south, initially led to the formation of Neolithic settlements and, afterwards, to the structuring of the Latin-Volscian territory with the construction of the fortified towns of Artena, Segni, Cori, Norba Sezze and Priverno; the latter was built along the junction of Italic colonization and the boundary of the Lepine ridge. The subsequent piedmontese trade route was followed by the Roman colonization of the valley bottom with the foundation of a stable civil organisation and an organic territorial form based on roads (chiefly the Appia axis) parallel to the Appenine ridge, where coastal and productive centres were linked by a structured thoroughfare system. After the decline of the late Ancient World and the Medieval revival of settlements built at an altitude (phase to which the current organisation of Lepine settlements corresponds), the drainage and restructuring of the Pontine marshes (the period from the late 19th Century to the present date) corresponds to the last territorial anthropization process cycle. – spatial continuity due to the grid of roads and territorial junctions hierarchized from the bottom of the piedmontese valley and from the Appia, and structured by means of the so called “miliare”modular system. – historic continuity as the last phase of a territorial anthropization process which proceeds from the mountains towards the valley, according to cycles and phases typical of every Latian territorial settlement process. Sabaudia’s urban organism, as in the case of other reclaimed rural centres, is the result of territorial routes. A rural settlement that sprawled into its arable land, Sabaudia is a farming village highly hierarchized by its singular (orographically discontinued) position and by its road network (linked to the coastal network) conferring upon it its role as a territorial node: “It is not a town”, wrote Piccinato, “but a farming village indissolubly connected to its territory and arable land”. This structure is polarized, in its centre, by (special) outbuildings forming the begining and end of its streets and, on its outskirts, by special “antipolar” constructions grouped together according to typological affinities. A choice opposed to the monofunctional areas philosophy of Modern Movement ideology. Polar buildings (see figure 1) are concentrated in the area surrounding the town square (town hall, post office, theatre-cinema formerly Fascist headquarters, trade unions, formerly Ex-servicemen’s Association, etc.). The building formerly used as a bus station was scheduled to polarize the road link to Terracina. Special antipolar buildings (former hospital and maternity and children’s hospital in the north eastern corner, farm estate and foresters’ centre to the south east, Piave barracks and dockyards to the south east etc.) are mainly distributed in the outskirts of the original town and, as Sabaudia expanded, they gradually assumed a new polar role, as in the traditional town. In the hierachization of poles, a key role is played by its town square and orthogonal street network, linking the thoroughfares of corso Principe di Piemonte, corso V. Emanuele III and corso V. Emanuele II, centralizing axes. The latter is fundamental as a continuation of one of the coastward routes departing from Appia. It is polarized, at the other end, by its entrance to Toigo square and is completed by parallel pedestrian footpaths, which become porticoes after Oberdan square. Among secondary polarities, that of Oberdan square acquires special value in that it terminates viale Regina Elena, whose importance lies in the fact that the main road between Sabaudia and Terracina leads into it. The architects behind Sabaudia did not draw up a simple town plan but entirely planned the town as a fabric of buildings lining streets; they only conceived the shapes of buildings according to the lay-out of streets and avenues. The sprawling of buildings from the centre towards the countryside expressed the lack of a net boundary with the countryside at the back, to which the town is linked by the road network of the reclaimed Pontine marshes. 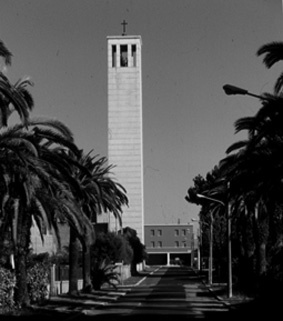 Mention has been made often of the fact that Sabaudia’s architecture leads back to the very heart of modernity. However, unlike many towns built at the time, the old part of Sabaudia is discreet, understated and hidden under numerous layers of modernity. What stands out in the interpretative originality of the new part of Sabaudia is the organic nexus between building and fabric and between building distribution and streets. 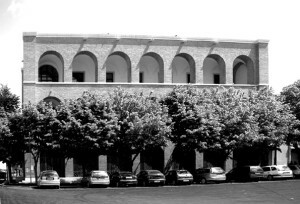 In this, the types used are un update of traditional forms: the town hall, in which the row structure with hierarchized rooms is organised by corridors leading into the courtyard polarized by the stairs, or the religious complex in Regina Margherita square, where the church’s nodal room is the continuation of a town axis reaching the altar from the main entrance, and the nunnery is organised, as in convent plans, along a path starting from the presbyterium. Furthermore, the nature of building elements and structures in Sabaudia is a modern derivation of the Roman plastic-wall cultural area. The majority of buildings are obtained from the composition of walls which can be interpreted as load-bearing and closing at the same time. This peculiarity is more noticeable (solider and more organic) when constructions are really built in supporting masonry whereas, when they are built with reinforced concrete frames, it is harder to interpret the nature of buildings from the partial exposure of the reinforced concrete framework, regardless of whether or not they are in brick, conferring upon centres a degree of seriality (see, for instance, pilotis-porticoes). Special buildings came into being together with their fabric and their distribution relates organically to the town’s structure: not by chance the fabric design and building plan in Sabaudia arose contemporaneously, conceived to update the town’s heritage. 2. Its historic continuity in the formation of its anthropized space between the major territorial structuring cycles (in the various phases into which it can be broken up: structuring, consolidation, recovery and restructuring) linking natural resources to the ways in which mankind lives space. 3. Building continuity in the relationships that connect building process products, from elements to structures, systems and building and civic centres. 4. Continuity in the readability of the built environment (and therefore also in language, the intentional product of the building production critical stage) which does not mean imitation and assonance with pre-existing ones, but consists of the visible result of a continuation and transformation process affecting all built environment characteristics (inner distribution and streets, static building structure of constructions and nature of structures used in the cultural area). 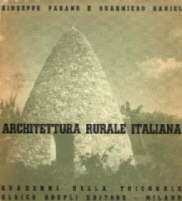 The concise reading that follows, together with its subsequent conclusions re-recorded in the design, is ordered according to the continuous formative process steps that produced the anthropization of the Pontine territory, the formation of Sabaudia and the hierarchization of civic areas and the construction of buildings. Despite considering Sabaudia as an aware, “artificial” product of a highly critical stage of architecture such as the passage to mature modernity, we therefore wished to acknowledge the town’s formation as the product of “long periods of time” structuring its pertinent territory in stages. These choices are expressed in the following design indications. Building is structured by streets and nodes (meaning by “node”, on all scales, the intersection of what is continuous or discontinuity of what is continuous). The building and architectural centres designed arise from the streets, as in the traditional town (we have attempted to show that Sabaudia is modern and not modern at the same time). – routes adjacent to the axis of corso Vittorio Emanuele II; this street joins up and continues the alignment and structural pitch of porticoed building constructed immediately after the Second World War. Existing porticoes are to be repaved to blend them in with the new designs according to a geometric scheme highlighting the continuity of the structural pitch between what existed previously and new action. – routes facing Oberdan square; this routes forms the margin of the square and orients temporary residences. 2 – Routes off the ground follow the development of porticoed streets on the ground and establish relationships between the specialized rooms of new buildings that serve to compensate and are similar or complementary to ground floors (like mezzanine floors in traditional building). 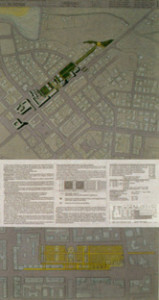 On account of thier function, these streets also form an integral part of building centres. 3 – Dividing routes are dividing lines between building and public civic areas; these routes cropped up spontaneously in the original town, even though they were often discontinuous and haphazard when basic building did not have pertinent areas, forming the necessary complement in the centralizing – dividing axis dyad. These routes help to indicate the nodal points of special buildings. – by the new viewpoint overlooking the National Circeo Park to be built at the end of the street parallel to via Biancamano in a raised area enabling Sabaudia’s orography to be perceived. this routed could flank the hill reaching Braccio dell’Annunziata on Sabaudia Lake and continue in the direction of the chapel of S. Maria della Soresca, forming a pedestrian circuit. The intersection of routes generates, as in the foundation town of Sabaudia (and in the traditional town), nodal points that are hierarchized according to the type of route and centrality of its topological position. These nodal points are not only hierarchized civic areas but also represent elements forming buildings themselves, confirming the indissoluble continuity between the formative process of civic areas and spaces inside special buildings. In other words, the area is “knotted” inside the building according to laws dictated by the civic centre, generating nodes which at various degrees are contemporaneously distributive and building, readable by means of the architecture of buildings. – new special building nodes destined for the Pontine Marshes and Reclaiming Museum and Historic Archive. They are formed by the intersection of pedestrian footpaths along the axis of corso Vittorio Emanuele (portico adjacent to the street that can be passed by vehicles and the applicable route adjacent to Plozner Park) and orthogonal pedestrian footpaths on the Oberdan square side (portico of special residences and applicable path adjacent to Plozner park). These footpaths are doubled off the ground by the overhead passageway linking constructions on the sides overlooking major civic areas (squares and streets) forming an integral part of the building. These nodes are based on the assumption that special building is traditionally connected to streets; their junctions trigger off the nodal points of buildings. Even though the museum-archive row building is linked to the repetition of openings along corso Vittorio Emanuele, these intersections hierachize the inner space generating continual spaces on various floors of the museum and entrance hall. specialized area (intersection and major distributive node). – node of the new hotel facilities building intended not only as reception facilities of the hotel structure but also as a conference hall and outdoor areas for seminars. They are formed by nodal points generated by the shifting of the two overlapping routes along corso Vittorio Emanuele. This node, which is hierachically speaking subordinate to the nodes of the museum-archive building, terminates the major footpaths of the new design and understatedly indicates to visitors, entering Sabaudia from the Appia, the organic structure of relationships between routes and buildings. – node of the former bus station now intended for entertainment and tourist facilities. This building already acted as a territorial pole, terminating the viale Regina Elena axis. Its function is radically changed by the new design, reinforced by the intersection of the pedestrian axis crossing Plozner park and decreased by the partial pedestrianization of the area preventing the transit of vehicles along corso Vittorio Emanuele II. The building will be converted from a territorial pole into a civic node, with visible consequences with regard to distribution and raised structures. In our opinion, these transformations are legitimized by the scarse architectural value of pre-existing buildings, whereas we intend to guarantee historic continuity with the town’s heritage by retaining its general plan. The structure itself of the existing building suggested that it be split into two buildings by the new path. The result is an innovative building type (common to a great deal of architecture between the two world wars) obtained through the remerging of two autonomous types: polar (the tourist information structure) and nodal (the conference and entertainment structure). Paths coming from the direction of viale Regina Elena are polarized by the entrances and stairs inside the building which, as in traditional special building, continue along a course. The most binding building from the functional, dimensional and expressive points of view is the building containing the historic memory of the town: the Pontine Marches and Reclaiming Museum (with an adjoining area for temporary exhibitions) that includes the Historic Archive for paper- and audiovisual documents of the history of the Pontine Marshes and foundation town and features an adjoining library and reading room intended not only for researchers on the topic but also for townsmen. Whoever is interested in the history of the foundation town understands the need for this type of structure (just think of the dispersion and, sometimes, of the loss of a great deal of material produced by O.N.C., the National Ex-Servicemen’s Association). Even though it is mainly an institutional problem, the provision of a physical seat to be used as an archive and museum will foster the concentration of collections (just think of the artists from the Pontine Marches who gave rise to a real type of painting) and archive material. 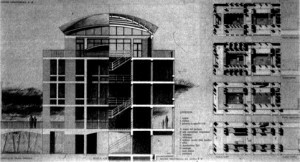 The ground floor houses the entrance hall and linkages to the upper floor (which distribute the building’s specific functions) by means of escalators and small business area (foreseeably, given the narrow width of applicable spaces: newspaper kiosks, a tobacconist, a small café, etc.). The library is to house management offices, archives and a reading room, with deposits on the mezzanine floor linked by a special hoist. The room for temporary exhibitions at 3.50 m off the ground is also the museum entrance hall. Placed on the same level and continuing with outside paths off the ground, this space will become a real square once the perimetral glass doors are opened in summer (see the sketch in perspective). The actual museum consists of spaces opening on to a central room covered by a metal vault and organised with a continuous course of inbetween floors connected by stairs for “top grade” finds and documents with the possibility also to visit material intended for specialists on the opposite side of the inbetween floor. The nature of materials used indoors (especially steel) indicates the “technological” core of the building, which will use high technology for archives and collections. The other building structures proposed are evident from the drawings: hotel, restaurant and associated conference centre; reception structures (tourist information, bank counters, hotel check-in and spaces for tourist associations and environmental safeguarding) with its own cinema-theatre that can be used as a conference auditorium. All structured and hierarchized by the route system. 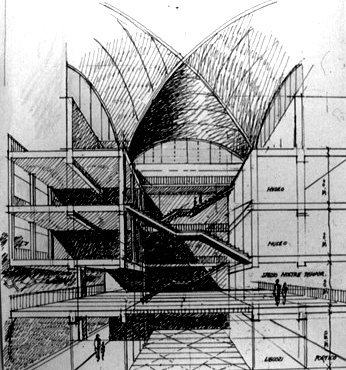 The resulting architectural space (both building and urban), we believe, is the synthetical conclusion of a logical and historical process. in «La Repubblica» del 15/8/1995. Sommerso sotto il cielo d’agosto da un turismo che ormai, dietro una stessa cortina di umani arrostiti dal sole e boutique balneari, unifica il villaggio delle Cicladi, la cittadina della Costa Brava, il porto delle Eolie, si stenta a riconoscere il carattere straordinario di Sabaudia, città silenziosa per vocazione. Occorre fare qualche sforzo di concentrazione per riconoscere la memoria delle origini, pure ancora evidente, di questa città singolare, amatissima da Pasolini. Origini che la nostra corta memoria storica associa al volto migliore del ventennio fascista, quello della “redenzione delle terre”, delle città di fondazione, delle bonifiche, ma che in realtà appartengono, se viste nei tempi lunghi delle grandi trasformazioni territoriali, allo stesso ciclo storico che ha portato, agli inizi del nostro secolo, come avverte Braudel, alla bonifica delle grandi pianure del bacino del Mediterraneo, dalla piana di Salonicco, alle aree del Basso Rodano, fino alla Mitidja algerina. Di questo epocale processo di addomesticazione idraulica delle paludi, Sabaudia, sorta nel ’34 tra due bracci del lago di Paola, sembra coagulare l’immagine più moderna: volumi ostinatamente puri, artificiali, costruiti come per esorcizzare l’antica natura ostile del luogo. Edifici che appaiono nelle foto d’epoca, visti dal mare o dalla maglia regolare dei campi coltivati a grano, come la semplificazione, estrema e trasognata, della città italiana, il trionfo della civiltà sulla natura selvaggia: evocano le architetture che si incontrano nei dipinti di Giotto, Ambrogio Lorenzetti o Taddeo Gaddi. Gli architetti che la idearono, Cancellotti, Montuori, Piccinato, Scalpelli, non disegnarono un semplice piano urbanistico, ma progettarono per intero la città, la forma nuda degli edifici, il sereno dispiegarsi dei viali. Le abitazioni, tutte a due piani, dovevano essere più dense, ad appartamenti, lungo le strade centrali; quelle più periferiche, per famiglie singole, più rade, a schiera; le altre erano case isolate, a carattere rurale. Il degradare della densità edilizia dal centro verso la campagna esprimeva uno dei caratteri di Sabaudia, città senza mura dove manca il confine netto col territorio retrostante, al quale la lega la rigida geometria viaria dell’Agro bonificato. E l’asse viario sul quale si imposta la città, corso Vittorio Emanuele II, infatti non è altro che la continuazione di una delle direttrici che partono dall’Appia in direzione della costa, la Migliara 53, il cui nome deriva dalle “fosse milliarie” fatte scavare da Pio VI per la sfortunata bonifica iniziata alla fine del ‘700 . E proprio la Migliara 53, traversate le quinte di verde del parco del Circeo, incontra la torre in travertino del Palazzo Comunale, con la sua campana di due tonnellate, cuore del sistema di piazze ed edifici pubblici: la piazza del Comune, circondata dall’albergo, dal cinema teatro, dai negozi; la piazza Circe, destinata in origine alle adunate ed oggi sistemata a parco; l’edificio dell’Associazione Combattenti (oggi Istituto Galileo Galilei). 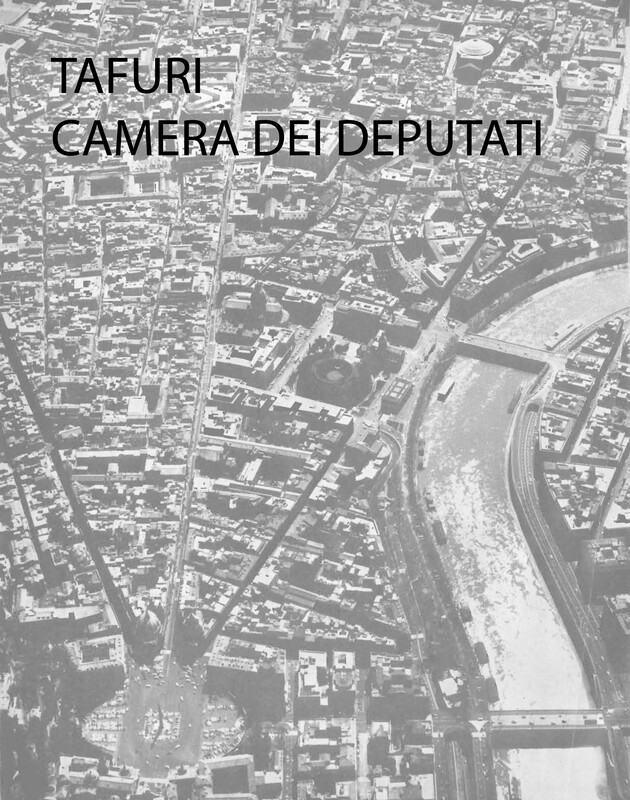 Architetture non a caso ammirate da Le Corbusier nel suo viaggio in Italia del ’34, che riconducono al centro stesso della modernità apparentandosi, è stato fin troppo spesso notato, al clima mitteleuropeo dei Dudok, degli Oud, dei Gropius. Ma che qui assumono un senso inedito: prive dell’ingegnosità dei modelli nordici (distanti dalle loro macchinose trovate), acquistano l’aria serenamente solare, fragile e incorruttibile allo stesso tempo, delle forme necessarie: non possono esistere, in realtà, che associate al luogo dove sorgono. E così, a differenza di molte città di quegli anni, la presenza dell’antico compare a Sabaudia in forma discreta, antiretorica, celata sotto molti strati di modernità. Ma per avere un’idea dell’originale organicità di Sabaudia bisogna rintracciare anche altri frammenti, alcuni dei quali autentici capolavori di architettura moderna: la gelida Chiesa dell’Annunziata, posta a fondale di piazza Regina Margherita, col grande mosaico di Ferrazzi incastonato nella facciata di travertino; le famose poste progettate da Angiolo Mazzoni, in corso Vittorio Emanuele III, lodate da Marinetti per la “policromia di forza e di entusiasmo che invita al colore gli altri edifici di Sabaudia”; gli edifici per l’Azienda Agraria e l’antistante Opera Balilla (oggi Centro Forestale) costruiti da Angelo Vicario in viale Carlo Alberto; l’Ospedale (ora U.S.L.) e la scuola disegnati da Oriolo Frezzotti in viale Conte Verde. Per terminare col bel ponte sul lago di Paola costruito da Riccardo Morandi nel 1962, ultima delle opere notevoli di Sabaudia prima della catastrofe edilizia. 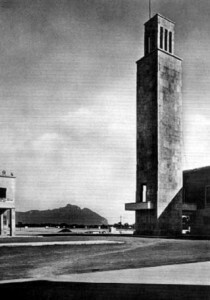 Ma in fondo la nuova città sorta intorno a quella originaria, proprio perché cinica e volgare come ogni periferia del dopoguerra, ha in un certo senso rispettato il nucleo “storico” lasciandolo riconoscibile: a Sabaudia ogni muro, come è giusto che sia, mostra al giudizio del visitatore la sua data.